South Korea’s military will reduce its number of troops to half a million by 2022 as part of a new round of defense reforms, the Ministry of National Defense said. The mandatory service period of rank-and-file soldiers will be shortened to 18 months in stages from the current 21 months, according to the ministry’s report. 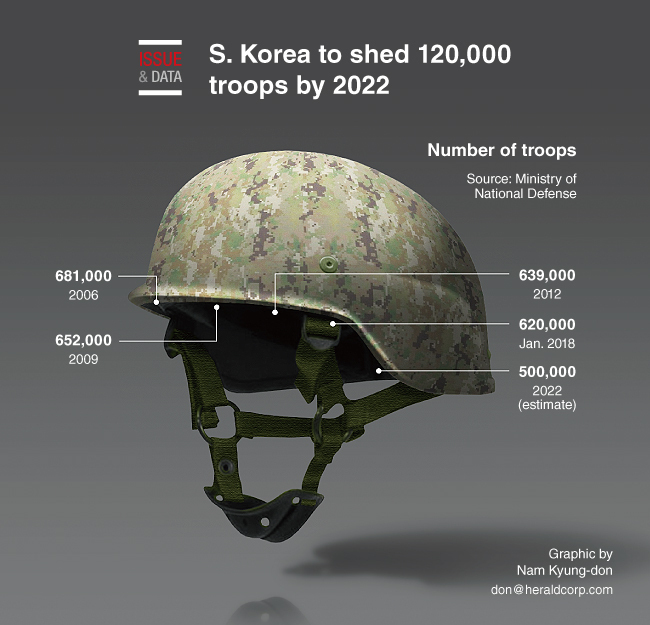 South Korea has 620,000 soldiers, including 483,000 Army service members, compared to North Korea’s 1.1 million. The Moon Jae-in administration has pushed for his “Defense Reform 2.0” plan aimed at making the nation’s military smaller but stronger.